We developed the Riser originally for our own use. We wanted a design that would provide a high-performance rigid platform so that release bindings would not have to adjust to a skiboard's considerable flex, one that was also universal and could be quickly user-mounted on any skiboard with no special tools and one that could be mass-produced at a competitive cost. We have evolved the riser design over a period of 10 years, improving it along the way to increase performance and streamline production. The current design is composed of two major parts - the high-strength aluminum riser mounting frame and the composite baseplate. 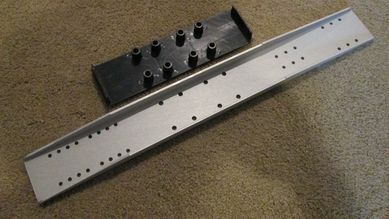 The two major parts are held together with four screws and nuts that can be moved for either the 4cm x 4cm mounting configuration of shorter skiboards or the 4cm x 10cm mounting used by skiboards longer than 110cm.